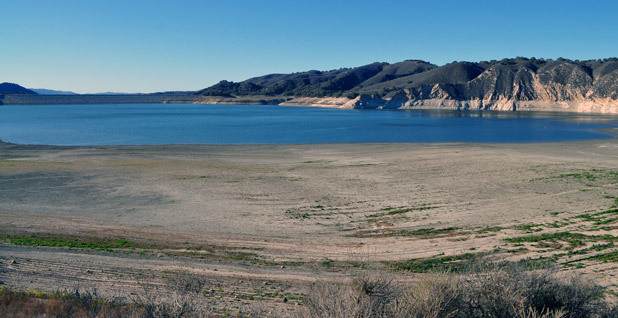 Cachuma Lake, a federal reservoir in Santa Barbara County that provides drinking water for 200,000 Central Coast residents, is disappearing. It is currently 14 percent full, according to state statistics. Photo by Jeremy P. Jacobs. California officials are facing increasing pressure to answer a simple but politically charged question. Exactly how much water is there in the state? Now enduring its fourth year of drought, California has never established a baseline measurement for water. Experts say that has led the state to promise more water than it actually has. According to some studies, the state has allocated up to five times the amount of surface water to farms and cities than exists through its complicated water rights system. And, further contributing to the problem, they say the state doesn't have an accurate picture of how much surface water is used every year. "Water diversions are still not measured in much of the state, and self-reporting is incomplete and sometimes of questionable accuracy," the Public Policy Institute of California concluded recently. "Paper water" -- water that exists in permits but not in reality -- is hamstringing the state's ability to curtail use and respond to the historic drought, advocates say. To be sure, they say, reforming that rights system will be complicated and contentious as water users with rights dating back more than a century oppose anything that could reduce their annual allotment. But there seems to be agreement that the state needs to know how much surface water it has, and how much is used. Without that, there's no way to allocate water specifically for environmental purposes, such as protecting aquatic ecosystems. State regulators are drafting regulations to improve water-accounting procedures. But the existing system contains massive loopholes. Environmentalists are losing patience, filing lawsuits challenging water contracts and calling for "public trust" flows to protect natural resources. "It's crazy when you think about it," said Carolee Krieger of the Santa Barbara-based California Water Impact Network. "You cannot manage a system that is as important as our water system if you don't measure it." The water rights system is complicated, revolving around three types of allocation. There are riparian rights that belong to landowners who draw their water directly from rivers and streams, pre-1914 rights for "senior rights holders" whose diversions began before the state created its permitting system, and post-1914 rights linked to State Water Resources Control Board permits and based on seniority -- meaning the first to establish the right is guaranteed his or her water allotment before a rights holder who applied for a permit later. These rights are administered in different ways, and that's where the problems begin. The State Water Resources Control Board has direct control over the post-1914 rights holders. For those, the system is well-designed for a drought. The board can systematically curtail diversions, starting with the most junior rights holder and working up to senior holders. Pre-1914 rights, however, are typically enforced by courts, not the state agency. The board has faced litigation when it has sought to curtail those diversions. Riparian rights are separate. They are not quantified at all, and the only requirement placed on the water is that it be put to "reasonable and beneficial use" as required by a 1928 amendment to the state constitution. For all three types of rights holders, reporting requirements for how much water a holder actually uses vary. Typically, riparian and pre-1914 holders -- which are major diverters -- are supposed to report every three to five years. However, those users can check a box saying it is not "locally cost-effective" to disclose their water use, and they don't have to explain why. About 70 percent of those rights holders check that box, Kathy Mrowka of the water board's enforcement division told Greenwire. That creates an enormous loophole. The Public Policy Institute of California report concludes that the water allocation system remains "hampered by inconsistencies, unclear regulatory authorities, and a lack of transparency and information." The range of reporting procedures muddies the ability of the state to calculate how much water it has, how much it is using and, consequently, how much it can promise to users. An August 2014 study by University of California researchers concluded that the state has doled out rights for five times as much water as it has. In a good year, the report said, the state has 70 million acre-feet of water available in rivers, reservoirs and other surface resources. There are water rights allocated for withdrawals of 370 million acre-feet (an acre-foot is 326,000 gallons). Some river basins, the report found, were allocated by eight times their usual availability. "Inaccurate and incomplete accounting of water rights has made the state ill-equipped to satisfy demands for water supply reliability and healthy ecosystems," the report found. Krieger's group did a separate study, which found the state was overallocated 5.5 times. There is some debate, however, over whether those numbers overestimate or underestimate the problem. Kate Poole of the Natural Resources Defense Council notes that the University of California research didn't include pre-1914 rights holders, so it undercounted some of the problem. Krieger noted, however, her group's study failed to account for water that is used and then returned to streams via runoff or other means. State regulators emphasized that overallocation isn't on its own a problem in the system for post-1914 rights holders. Thomas Howard, the water board's executive director, said those studies looked at the face value of water rights, or the maximum amount of water that could be drawn, every day during the time frame granted by the permit, and sprayed constantly on land. The problem, he said, is that's not how water is used. "We started using the face value numbers because it was a convenient way to assess fees," Howard said in an interview. "But we never thought it was the amount of water being appropriated." Ted Grantham, an author of the University of California study, agreed, in part. He noted that the seniority system for rights holders theoretically works well in times of drought since the board can cut the amount allowed to be diverted by junior rights holders. That, he said, "can be a very effective way to manage water." "The problem is when you don't have accurate accounting, it becomes very difficult to manage at the system during periods of water scarcity because you don't necessarily know to what degree users should be curtailed or who should be curtailed," said Grantham, who is now at the U.S. Geological Survey. "If we had a much better system of reporting and a sense of how that water is being used, you could allow for more targeted and more restrictive curtailments." Howard and the state board think they are on their way to accomplishing that objective. Last June, Gov. Jerry Brown (D) signed S.B. 88, a law mandating new measurement and reporting requirements for about 12,000 rights holders who divert 10 acre-feet or more per year. The water board is crafting regulations that will go into effect in January. They are expected to require reporting every year and will likely close the "locally cost-effective" exception loophole. Critics, however, say more will need to be done, including some likely controversial steps to reform the water rights system. A major hurdle will be reforming pre-1914 water rights. Holders of those rights typically believe the state board can't order them to curtail their use. Last summer, the water board ordered about 100 senior rights holders to stop using water from the Sacramento-San Joaquin River Delta and its tributaries, the primary water source for 25 million people and 3 million acres of farmland. Several irrigation districts holding those rights sued, and a state judge agreed with them, ruling that the state should have conducted a hearing before issuing the orders. Days later, the board backtracked from those orders (Greenwire, July 16). The case raised the question of whether a pre-1914 right constitutes property protected under by the constitution, an issue that is sure to be litigated in the future if the state again takes step to curtail pre-1914 rights holders' use (Greenwire, July 27). A primary recommendation of the Public Policy Institute of California report to address this issue is bringing all water rights holders under the authority of the water board. Buzz Thompson, a Stanford Law School professor and co-author of the report, said that action shouldn't be controversial because it wouldn't technically change the value of the pre-1914 holders' water rights -- meaning they would still have access to the same amount of water. The major difference would be that disputes and enforcement would be administered by the water board instead of courts. And he noted that because of the "reasonable and beneficial use" clause of the state constitution, the board already has significant authority over the pre-1914 rights holders. But he acknowledged such a change would be politically difficult. A lot of pre-1914 rights holders, he said, "do not trust the State Water Resources Control Board." Thaddeus Bettner of the Glenn-Colusa Irrigation District agreed. Bettner's district in the northern part of the Sacramento Valley is home to some of the oldest water rights in the state. Farmers there grow rice and other crops, and it contains native habitat of some species of endangered salmon. After reading Thompson's report, he said that recommendation would be more challenging than the authors suggest. "That is one of the biggest issues," he said. "How do you go in and start to quantify what those rights are and prioritize them?" He added, "Somebody could read that and say that's no big deal. But it is kind of a big deal." The water board's Howard acknowledged there are problems beyond the measurement and reporting issues. He said there are five characteristics of an effective water rights system: Measure everything, establish public trust flows to protect wildlife ecosystems in all streams, adjudicate the system to make sure all diverters know exactly what they may receive relative to others, make sure an agency can enforce the process, and guarantee that the agency has resources to do its job. The new regulations are step one. "We are at the infancy of trying to put together a water rights system that is functional and allows for the protection of water resources and for people to understand what they have in relation to everyone else," Howard said. Some environmentalists, however, think action is needed more quickly. NRDC, for example, has filed lawsuits challenging water delivery contracts between senior water rights holders and the Bureau of Reclamation because of their impact on protections for endangered salmon in the state. The 40-year contracts, which were renewed in 2005, specify that those users receive 75 percent of their allocations from the federal Central Valley Project, even when water levels are low and regardless of whether they affect water needed for salmon protections. The water rights holders argued that those rights cannot be abridged (Greenwire, Nov. 11). NRDC's Poole said the lawsuit is partly the result of the state refusing to undergo a broad accounting of exactly how much water there is, then dividing it up appropriately between urban and agricultural uses, as well as environmental protections. "California needs a water budget, and it doesn't have one," Poole said. "We've never done that, and that's the fundamental approach that we need to take."